If we practise Qigong in our early days, when we are a child or a teenager, then we will have a better result when we are older. This is normal, just the same as if you buy a new car and look after it, service and maintain it every year and do not overuse it will last longer. But if we get an old car which already has some damage and then start to look after it we can still make it last longer, but it will never be as good as if we started looking after it when it was new. So when people buy a car they always check its history and its mileage. Everything is like this, so if we practise Qigong earlier in our lives then we will always be better because of it. 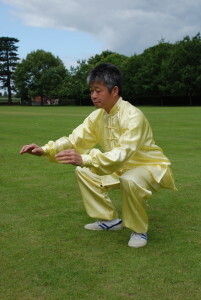 I see some teenagers in my classes who study Qigong and Chun Yuen Quan, they are healthier and their studies are better. So if our Yuan Qi 元氣and Zong Qi宗氣are strong then we can imagine that the Ying Qi营氣 and Wei Qi 衛氣are also strong. This is because Ying Qi and Wei Qi are based on Yuan Qi and Zong Qi, one is the roots, one is the trunk and branches. Without good roots there cannot be a trunk and branches. Do not even start to think about fruit, leaves and flowers. If the supply of nutrients is good, then the immune system and temperature will be good. This is why we are healthy when we practise Qigong. je cherche les exercices pratiqués dans la “3e méthode”, “Wu Yuan Zhuang”, et je ne trouve pas des images ou/et des vidéos (gratuitement) : pouvez-vous m’aider ? Thank you for your message. Unfortunately we do not have any information on this.